One major challenge facing the world’s agricultural sector in both crop and livestock production is the threat of global climate change resulting in arid and desert lands in some regions of the world. An area is considered as a desert when there is a low precipitation period below 10 inches in a particular geographical region caused by prolonged water supply shortages. Agricultural activities in crop production for humans and fodder supplies from crop residues for livestock rearing is at declining state in crop production. Although the Middle Eastern parts of the world might have been an excellent cradle of agriculture, the region is not friendly enough for crop cultivation. More than two-thirds of the region is a rugged desert and producing enough food for a fast-growing population is one of the most difficult challenges for the Arab countries. The middle east population rose from 92 million to over 350 million between 1950 and year 2000 with over 411 million as of 2016 increasing at about 3 % every year with more need for food production. The problem of water supply in desert encroachments has created difficulties for crop and livestock farmers to accurately predict the frequency and amount of rainfall throughout the year. Farmers have to be more conscious on the need to conserve water for future use. A more sustainable water conservation method for crop and livestock forage producers for higher growth and yield in resistance to desert aridity is hydroponics and aquaponics. The conventional method of crop cultivation through soil takes into consideration the use of artificial irrigation in the absence of rainfall. A whole lot of water is applied to the soil to ensure good infiltration for absorption by the plant root. A significant disadvantage is that only a small percentage of the total water is used up by the plant. Hydroponics leaves the soil behind and focuses on the plant to solve water wastage by using a re-circulating nutrient reservoir. The introduction of the hydroponic farming application into desert regions allows for better control of weather and climate. Hydroponic containers and greenhouses give excellent control over the growing environment since the heat, moisture and light intensity can be manipulated. This control enables cultivation of several veggies through the year and season with adequate little spacing within a short period. Plants cultivated in dry climate tends to appear wilting and most likely infested by insects, fungi and diseases. Hence, hydroponically grown crops are lifted up above the ground and are prevented from infection by soil-borne pathogens as found in traditional soil growing media method. In conclusion, countries of the middle eastern climates should have a keen interest in developing hydroponic farms, growing plants in a nutrient rich water solution and soilless medium. 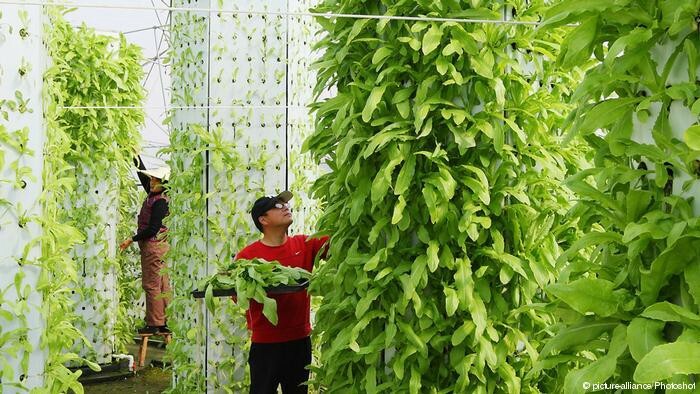 Furthermore, because of its economic viability to function as a possible solution to drought and inaccessibility to adequate water, this agricultural technology resolves many of the difficulties inhibiting year-round growing.